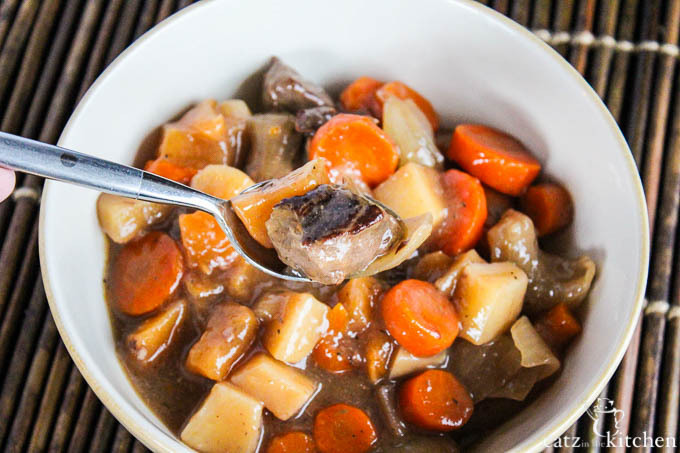 This delicious and hearty stew slow cooker Irish stew recipe will (maybe?) have you imagining that you’re sitting in an Irish Pub with the locals. I love holidays and since becoming a food blogger its only made me embrace holiday food more. I was telling Josh the other night, that if it weren’t for blogging, I fear I would still be living a little shell and not get to experiment with foods from other cultures. Food tasting from other cultures is very important. I mean, you guys know that we take our Italian and Mexican/Latin cuisines very seriously, but we don’t really venture out past that very often. We don’t cook a lot of asian food (unless you count stir-fry) or thai food either and trust me, that is something we both want to rectify. But holidays give Josh and I a chance to venture out a little bit and try a few new things. Irish food is something we both like. In our city, we have this very Irish little pub and the food is amazing! Their fish n chips are out of this world, their mac and cheese will have you swooning and their desserts are incredible. I’ve only been there once (back when I was pregnant with Christian) and I’ve been wanting to go back like crazy and try other entrees. I would say St. Patricks Day would be a great day to go, but the place is already crazy popular with the locals and on St. Patty’s Day….I think we would never get a table. 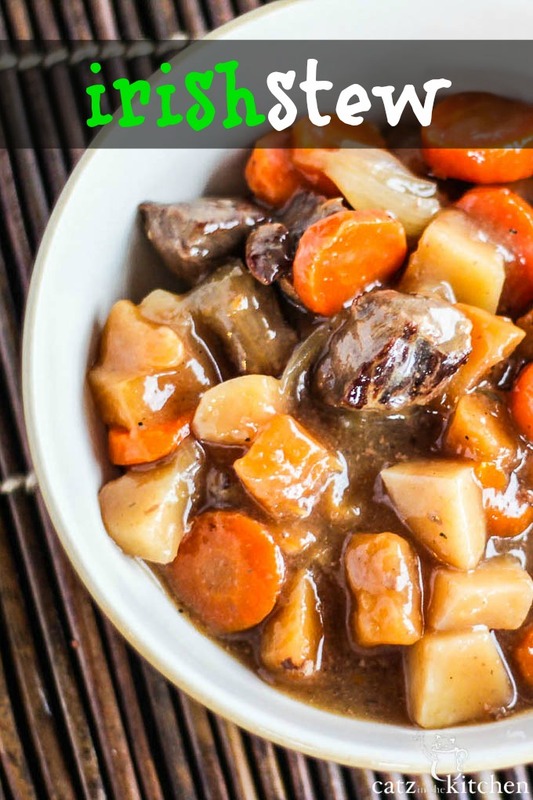 Since that will likely be the case with most Irish-type establishments on the 17th, you can always have your Irish meal at home and with the help of the slow-cooker! The original recipe called for boneless lamb which is a traditional choice of meat, but I ended up going with stewing beef for mainly one reason. Little did I know that boneless lamb is so expensive. I know it’s a great cut of meat, but I was not about to spend $25 on it. I’m sure it would of made the flavor of the stew even more exceptional, but hey, I’m a mom on a budget and that $25 cut of meat did not fit into it. But regular stewing beef works very well and it this is one Irish meal I will be cooking again in the future, whether its for a holiday or not. 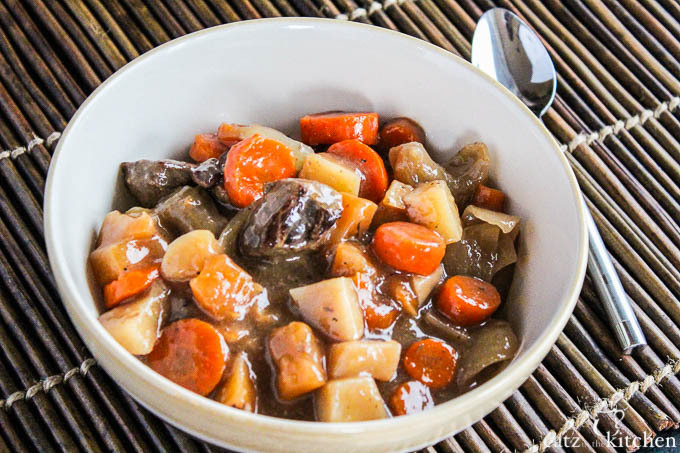 This delicious and hearty stew slow cooker Irish stew recipe will (maybe?) have you imagining that you're sitting in an Irish Pub with the locals. In a large skillet of hot oil, brown stewing beef in half batches. Drain off the fat. Set aside. In the bottom of your slow cooker, place cut turnips, carrots, potatoes, onion, tapioca and seasonings and stir together. Add in the browned beef and broth, stirring to combine. Cover and cook on low for 10-12 hours or on high for 5-6 hours. Serve with drop biscuits or Irish soda bread. Mmmm, this looks so warm and comforting! Which is totally needed since it's still cold here during this never ending winter! I think the word stew is just kind of a comforting word in general. Make it, it will make dealing with the weather a bit more bearable. When would you add in the quick-cooking tapioca? How much should you cook the meat in the skillet? Is it just a quick sear on all sides, or more than that? It's just a quick sear. Just long enough to brown the sides. I'm usually pretty quick about it too because I hate oil splattering every where, lol! The meat doesn't need to tossed with flour first? Why the tapioca? Is it optional ? Can you substitute Guiness for some of the broth? Perhaps just one cup of stout to two cups broth? What cuts of beef will make the best stew meat? I want to ensure the beef comes out with a nice texture and is tender. Hi, Loretta - good question. Chels and I are sitting here discussing this, and it's a tough one. We do most of our "crockpotting" in a 6-quart slow-cooker, so there would certainly be a few adjustments. First, if memory serves, this recipe only filled up our slow-cooker halfway, so you should be able to get by halving the recipe ingredients - no need to take it down to a third. For cooking time, check it in the 6-8 hour timeframe, and make sure the beef broth isn't evaporating too rapidly - add more if need be to make sure the ingredients don't burn. After that, whenever the veggies are tender and meat is cooked through, you should be good to go! Does that help? Thanks for reading! I wanted to print off the Irish Stew recipe, so used the print button. Instead of just the recipe, it printed off all 22 pages of the pictures of other foods (NO recipes)). It would be helpful if there was an indication of whether just the recipe will print or if everything on the website prints as well. I found this to be a waste of paper, ink and time.! Serves 6 About how much is a serving? Hi, Mary Jo - I would estimate two cups. If memory serves, the recipe filled the crockpot about halfway, and it's a six quart crockpot. Three quarts is 12 cups, which would equate to two cups per serving. It's a chunky stew, but one cup certainly wouldn't fill you up. Hope that helps! I've just done a google search for drop biscuits - they're scones, right? Probably a lost in translation thing, for us Kiwis a biscuit is like an oreo.